Hilton's first modular build hotel in Africa is, the 280 guest-room Hilton Garden Inn in the Ghanaian capital of Accra, a concept that Hilton first premiered in 2014 through a partnership with CIMC Modular Building Systems. Hilton has marked this year’s African Hotel Investment Forum (AHIF) with the announcement of new properties and extensions in three African countries. It continues the company’s commitment to expansion across the continent as it seeks to double its footprint from its existing 39 hotels to more than 80 hotels in the next 3-5 years. Among the new hotels agreed is Africa’s first modular build hotel, the 280 guest-room Hilton Garden Inn in the Ghanaian capital of Accra, a concept that Hilton first premiered in 2014 through a partnership with CIMC Modular Building Systems. Other deals see the creation of Africa’s tallest hotel in Nairobi, while Hilton builds on its industry leading airport hotel legacy with an extension to the recently signed Legend Curio at Lagos Airport. Hilton will manage all three properties as it continues to expand its managed hotel portfolio. Patrick Fitzgibbon, senior vice president development, EMEA, Hilton Worldwide said, “Having been present in Africa for more than 50 years we’re proud to have remained at the forefront of pioneering hotel growth on the continent. This year at AHIF we’re breaking new ground in the region with the announcement of our first modular build hotel, a fast-paced construction solution that we feel has huge potential in Africa, with quicker returns for investors and a world-class hospitality experience for guests. 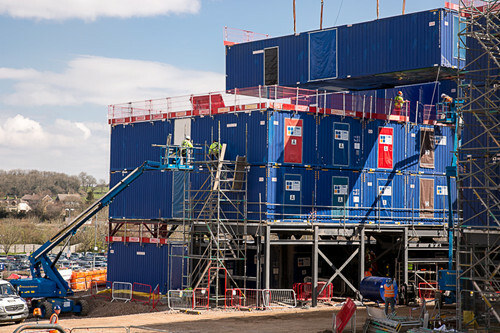 Modular construction is an innovative solution that can be used to drive hotel development, offering numerous benefits including faster development, streamlined design and cost efficiencies. The process involves assembling portions of the hotel - including guest rooms and hallways - in China, before transporting them to the final site for completion, thereby significantly reducing the time taken for construction. The model helps ensure consistent quality and accelerates the build schedule on site, a particular benefit for developers and investors in emerging markets. Hilton Garden Inn Accra Liberation Road is being developed under a management agreement with Independence Properties Ltd, whose majority shareholder is Trasacco Estates Development Company Ltd. With a planned opening in 2018, this will be the first Hilton Garden Inn in Ghana. Ian Morris Director Independence Properties and CEO Trasacco Estates Development Company said: "After building a number of three star plus properties in West Africa the option to go modular and improve on room quality, project delivery and minimise construction risk was warmly embraced by our development, design and construction teams and we feel is the future of the industry." Located on Liberation Road, the main connection between Ghana’s capital and its major international airport, the hotel will feature three restaurants and amenities offered at each Hilton Garden Inn location, including complimentary high speed Wi-Fi throughout the hotel, 24-hour business and fitness centers, alongside four adjustable meeting rooms and a 450sqm ballroom. A management agreement with Jabavu Village Ltd and White Lotus Projects sees Hilton expand on its existing presence in Kenya to create Africa’s tallest building. Standing 330m high, Hilton Nairobi Upper Hill is due to open in 2020, as a 255 guest-room and suite hotel in Kenya’s capital. It will offer multiple food and beverage outlets, including a relaxing poolside bar, specialty smokehouse and grill restaurant, lobby dining area with landscaped deck and a boutique rooftop bar with unbeatable vista views of the Nairobi skyline on the 43rd level. Finally, having previously announced the signing of Curio, The Legend, Lagos Airport, Hilton has also confirmed that an additional 76 guest rooms will be added to the hotel bringing the room count up to 130-keys and further strengthening its expansion in the country. The hotel, due to open during 2017 will be the first within the airport environment giving guests and airline passengers alike unrivalled ease of access to the airports’ facilities.